tipped you off, I'm counting on the same amazing deal again this year. boxwoods and evergreens to our deck and patio. My friend Linda just read they're the most popular shrub, check out what she's planning. Maybe I can find a spot for one of those, too! Do you have any new landscape plans on the horizon? I love this look. My type A personality prefers the precisely trimmed variety. :) I actually just found some beautifully shaped ones at our IKEA of all places...... for $15 each! Looking forward to seeing what you choose! I am completely consumed with my gardens right now and loving it. Thank you for all these inspiration pics! 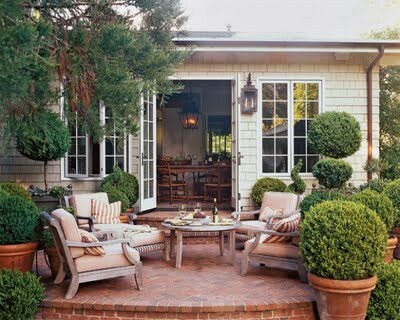 Maybe I'll incorporate a few boxwoods into a new garden I'm making. So pretty. 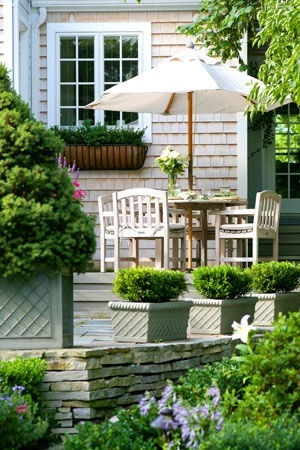 Boxwoods are my favorite, so elegant and tailored, love them in the ground as much as I do in pots...beautiful! I love boxwoods and cypress trees. And I like them trimmed. I love your inspiration photos of the patio! I don't really like to trim them so I leave them a little more natural and only give them a haircut when absolutely needed! Love this look! Can't go wrong here! 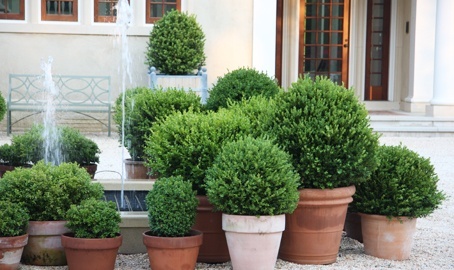 I've have boxwoods on the brain too, and want to bring out all my empty pots and fill them. They work so wellin VA and stay green all year long with little maintenance. PERFECT. Still a bit early to plant annuals here, so it's boxwood time now. Enjoy sweet filene! I like when they're a little wild not shaped so much. I'm looking forward to getting my hands dirty for a few weeks after we move to the new place and discovering what we've got in the yard. Gotta keep my eye on HD! Great inspiration! I was just looking at those the other day for my front porch. Luckily, the deer don't eat them since they eat everything else around here! The English dwarfs are my favorite. They stay pretty tidy without a lot of trimming. Love these images! I love Boxwoods! They work so well anywhere!! Such beautiful photos. I especially love boxwoods. Please let me know when to head to HD! Your pictures are inspirational. I love boxwoods. I think I will have to add a few to my sparse builder-landscaping. What a wonderful idea! Unfortunately we have a few that were in the ground in front of the house that are going to have to be pulled due to dead spots. So maybe, just maybe I'll pot some up in planters this year to use on our back deck. You always have such lovely ideas and execution of said ideas! Have a wonderful day! love that first picture, so beautiful! they are so cute- what's not to love!!! i would love to get some but i don't have quite the right place yet.... we have these ugly shrubs we want to get rid of one day and i would love to have these instead. Hey Pam, love boxwoods... of course! Costco has a HUGE shipment that we saw a few days ago. I think they were $15 each, also had beautiful magnolias. Happy gardening! Make sure to show us your results! 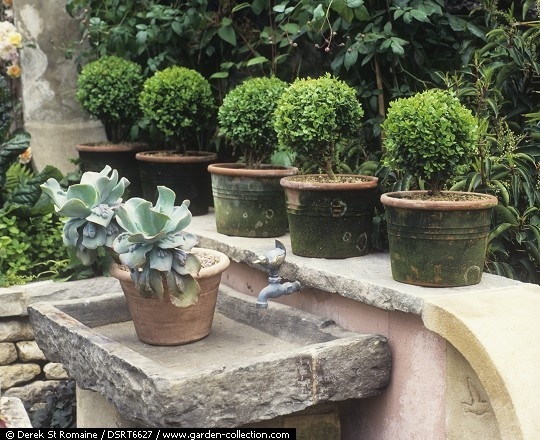 You can never have two many boxwood- cant wait to see your outdoors transform soon! !